Lately I have rediscovered my love of sewing and have made some aprons for friends (FA APRON SWAP see gallery and 'apron' thread in forum). I thought it would be lovely to make a recipe book to go with each apron. This book came about by accident. As you can see it is a pre made book. I fell in love with the cover, bought it with the intention of putting some of my favourites in it as a little part of me that she will keep. I got it home to realise there were no dividers. I also wanted to put a photo of us in it. As you can see the pages below are all the same, so they had to be altered. One thing led to another and here are some sample pages. These are photos I have taken of my dear Rebecca with her children, appearing here with her permission. The categories were: soup, entree, mains. dessert, yummy treats and everything else. The tabs are made with a one inch circle punch and some small Heidi Swapp acrylic pieces which are decorative and give strength. Below I will give details on how to make them. The second book I wanted to make from scratch was for our Apron Swap for Briony. I was inspired by a nifty little cookie cookbook Sonia gave to me for Christmas last year. 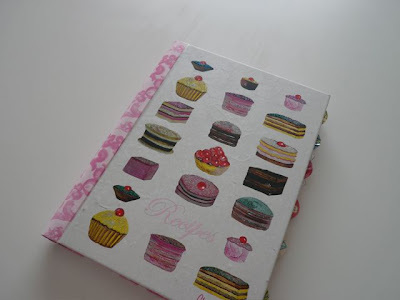 I know Briony has hungry little children and I thought a recipe book just for sweets might be handy. I picked a scrap piece of paper and card stock that complemented the colours of the apron I made her. 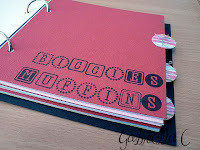 I chose 6x6 inch as it is economical and perfect recipe card size. I chose my categories and then made sure I had a good number of pages. The cover was 2 pieces of card stock stuck together and slightly larger than the pages. 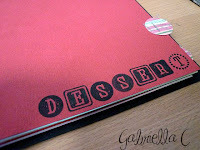 I find alphabet stamps are good to use in books as you get the same font and it economical. I always test out the size of the word on my pages by substituting any letter to create the word (see below). I then stamp the first letter last if the last letter is near an edge so as to ensure i don't end up off the page (lesson learnt the hard way..!). 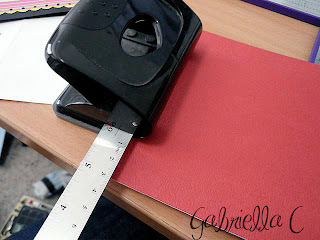 In this book I used a hole punch and jump rings so that Briony can easily add pages if needed. I measured each set of pages as I punched them to ensure correct line up. I was so pleased with my tab technique that I decided to use it again. 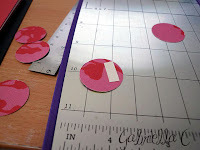 Here are the circles - I used double sided tape on half of the circle then stuck the two circles together, leaving one half of the circle tab un adhered so as to be able to slide the page between the two circles then staple it on. I also measured out my tabs before I started so that i had good tab spacing. I hope this demonstrates that you need not use complicated techniques and loads of product to make a lovely gift and use up some scraps! 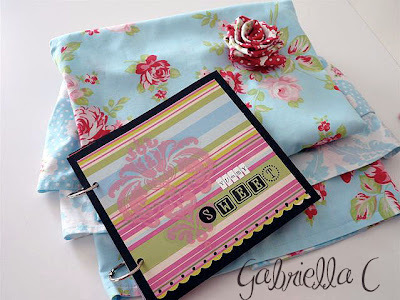 Your book will look better if you have a style theme ie range of papers, embellishments etc. Look through your leftovers and I bet you will get some ideas! 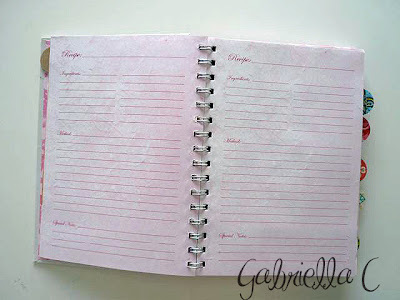 Use similar styles/templates for each page that you decorate. It cuts down the work and makes the book pleasing to the eye. 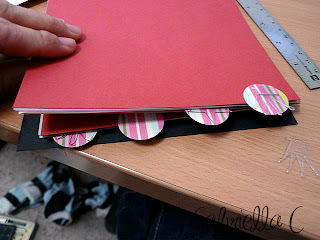 Think about your binding technique - my bind it all is one of my best crafting investments but I like jump rings if the user might add to the book themselves. There are lots of ideas on line in this area. 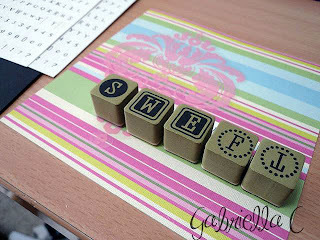 If you are unsure about a stamping effect or hand made embellishment, make a practice first. Go with scraps. Experiment and have fun! I recently made a 'Lego Creations' book for a little boy who I knew loves Lego. Mum takes pics which are stuck in on one side and on the other he gets to tell a story about his creation. I thought that was a lovely learning tool and memory keeper in one! Drop by the forum with your questions or tips... I would love to hear your book making tips, experiences and ideas! Thanks for the tutorial...I needed this ! Great tutorial Gab, you have inspired me to make my bestfriend one. Thought I might call it lunchbox recipies. Simply gorgeous Gab, some great tips there! 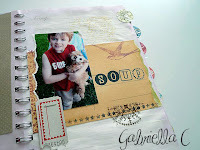 Fantastic Gab...i havent done any kind of album before so really appreciate the tutorial.